Sat, 11 Jun 2016 at 6:00 a.m. It is a great credit to him that a Private company would employ him. Most of them would not be employable in the roles they are currently overpaid for. Suspect ODT will get to the bottom of where he’s off to and with how much notice. Guess I’ll never find out who spent the DCC’s “$20M cash on hand”, on what treasures or pet projects. Given my LGOIMA information request failed. You could hardly blame Grant for leaving.lt must be frustrating, while trying to get the DCC’s books into order, having to deal with local body politicians who willfully run amok in the lolly shop. It would also be a very unsatisfying life living with the failure of others in the organisation to show leadership and deal with ongoing corruption from the past. He has given up on this greater challenge to run a provincial paper instead. You could hardly blame him as he has a younger family, I presume, and there is more to life than living what must be hell in the DCC. If you value your life it would be a very simple decision to leave. Let’s hope others follow suit but for parts unknown, never to be seen again. Then again the +$600M consolidated council debt still remains, and the misfit councillors are keen to get on with truthless cycleways to help Spokes. No one else benefits, let’s face it. Repeat repeat : DCC still has major financial problems and an aging population of low income ratepayers and renters —which can’t be solved by superficial ad campaigns led by Enterprise Dunedin. Further to the updated post at top of thread. Grant McKenzie says he is leaving the Dunedin City Council in better shape than he found it. It was announced yesterday Mr McKenzie, the council’s group chief financial officer, would join Allied Press, publisher of the Otago Daily Times, as its new chief executive. Mr McKenzie, in an interview with the ODT yesterday, said he was excited about the challenges ahead, but leaving the council had been a difficult decision. I suppose it is such a challenge deciding whether to run or walk. Then of course he could gallop perhaps – ho hum decisions decisions. Re the cycleway link: http://www.odt.co.nz/news/dunedin/386475/cycleway-priorities-changed (quoting article): ” Last year’s pared-back proposal came after a realisation people wanted a higher quality network than originally planned. I heard Mayor Cull make this claim at a meeting – that the council had realised that people wanted a higher quality network than originally planned. Now this ODT article is repeating it and it’s not clear whether it’s the reporter’s statement or an unattributed quote. Maybe, if it’s repeated often enough, it will be generally accepted as true. Except that there’s no evidence of its truth. People’s complaints that the SD cycleway network had serious problems didn’t necessarily logically mean they were indicating they wanted ‘a higher quality network’. It may just as much have meant they didn’t want one at all. More likely a realisation that cycleways are much harder to integrate into the existing traffic network than the DCC assumed. And, as a consequence, much more expensive. 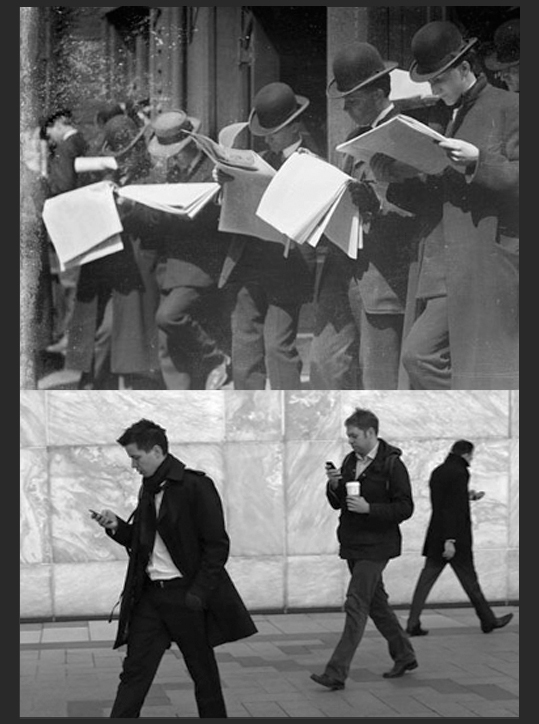 Not the same story at all. I agree. Something about this is screwy, not least the vote-catching tendency. The Dunedin City Council remains on track to record debt levels lower than $220million, despite its latest financial results showing more than $9million had to be found in two months. At its recent annual plan deliberations, the council committed to spending an unbudgeted $500,000 on a $1.77 million hockey turf at King’s High School, as long as council debt was lower than $220million by the end of the financial year. Financial results disclosed in the council’s finance committee agenda show debt was at $229.678million at April 30. What makes one school more special than others. Vote out these councillors plz. Page 2 of the ODT. Council in 2014 had a debt mountain worth more than $600 million. Turn to page 6 and the headline reads: “DCC debt forecast to go under $220 million”. If things are that good why the 300% above inflation rate increase. Or is the election propaganda starting already. The confusion deliberate or otherwise between consolidated council debt and, council debt ? What’s a few zeros between you and your ratepayer bankers. The latter being the people who pay for every council budget blunder against prudence and fiduciary duty that has stacked up year in year out forever more. Until we say no more. How do you get to have the DCC core debt under $220 million? Easy, but first, Nightrider needs to understand that ‘core debt’ is only that applicable to the DCC. The true debt of $600m is the ‘consolidated debt covering the DCC, “and” DCHL’s undertakings. That is in effect the total held by Dunedin City Treasury Ltd (a division of DCHL) the financial organiser for the overall ratepayers’ interests. Back to the ‘easy’. If you want to meet a target like that, first you have to get near it by transferring all that you can into the ‘consolidated pool’ That was done by shifting over $130m from the DCC to DVL (the new Stadium owner) which had a huge impact as can be seen. It hasn’t gone away, just put in a different cupboard. Then you defer budgeted expenditure till the next year, don’t uplift budgeted borrowings for those projects and ‘Bingo!’ the debt comes down to target. The fact that it is only deferred is the ‘smoke bit’. The ‘mirror’ is what you look in and see that the debt reduction target has been met. That is a major reason why the reluctance to bite the bullet and do the right thing and fix the South Dunedin stormwater infrastructure. It will require many millions of dollars which the DCC simply doesn’t have. It is determined to “skite” about its debt reduction and at the same time hold rate increases to below the arbitrary figure of not more than 3%. Patently not possible at the same time as dealing to the South Dunedin problem. Tough on South Dunedin folk, but “them’s the breaks”, as they say. Face it, there’s an election in October. So there you go ‘Nightrider’, believe what you will, but not because the folk in the DCC tell you to. As a postcript, I recap the fact that the DCC’s ‘core debt’ in 2001 when CEO Jim Harland came on board was just $35m, ten years later we have a Stadium, a revamped Dunedin Town Hall and Conference Centre, a hugely enlarged Otago Settlers Museum, all debt funded which took that to $360m. Hive off $130m to DVL and that gets back to $230m. Only $10m to go. How hard was that? But watch out for future years, these ‘spendersm’ haven’t lost the urge for profligacy by any means. ODT’s Saturday/Sunday edition feels to be becoming thinner. What will happen in the fiercely competitive world of the global media big boys as they fight for market share. Steep multimedia, technology and social media advances to battle…. after local body sniper fire, blackouts, hijackings, rock’n roll swindles, civil war, and incursions. The pay wall forecast for April this year has not yet landed. The nuclear-fuelled, by comparison, investigative NZ Herald where we get most of our news, has sensibly held back, thus far. Radio New Zealand is dancing on a pin, chronically underfunded by government. Allied Press has new schemes on the table. Astute experienced media men and women will be needed to plot trajectories. 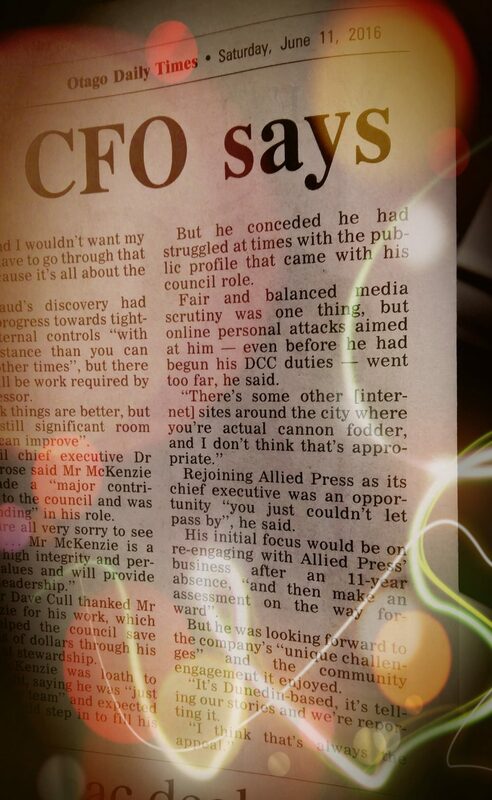 But he (Grant McKenzie) conceded he had struggled at times with the public profile that came with his council role. Fair and balanced media scrutiny was one thing, but online personal attacks aimed at him – even before he had begun his DCC duties – went too far, he said. I don’t think some council staff like being questioned (grilled?) by councillors in meetings open to the public or being expected to respond to questions from members of the public either. Not everyone has the disposition to be a public servant. I just hope DCC doesn’t end up with only those staff who can’t find employment elsewhere. I can think of one relatively recent addition to DCC staff who I think is making an excellent and positive contribution and seems to enjoy their job, including dealing with members of the public. So they do exist. But I guess DCC has to compete with other councils to get and keep them. Sat, 11 Jun 2016 at 1:14 a.m.
McKenzie going to Strictly Coffee yesterday with Stuart Heal, the chairman of NZ cricket! Now “what lights from yonder window breaks”. Apologies I think to Will. 11,733,034 views in just two days and climbing…. When you change trains, you will notice a man shouting ‘Pardon me girl, sorry, Madam. Is that the Chattanooga Choo Choo?’. Reply, ‘Yes. Track 29. You better get there on time’. A lighthearted interpretation of the move to Allied Press Ltd. It is a heart rending story of difficult decision making when one is forced to forsake all for love ….but all is told so graphically by these two local artists. And they will be back again next week ….so popular they are with the peasantry. On to fame and glory with the tired Old Nats. Excuse poor screenshot detail from ONT front page. Council corporate services group manager Sandy Graham has become strategy and governance general manager, while services and development general manager Simon Pickford has become community services general manager, with new responsibilities for each. There should be men’s fashion coaching – how drab is life after 45.
Who should they be coached to attract, whose environment is it their duty to enhance by their appearance? Vitality, entrepreneurship, don’t need uniform suits ? (penguins lead penguins) ? At this juncture getting away from the accountant-look would help Dunedin ? Business creatives can have a variety of looks – to be good role models for clever school children, not the male dominated world of suit-wearers as the laudatory power force ? I worked with a woman who wore the same tidy outfit all week, washed it weekends. It was an unmemorable outfit, the only nonconformist thing about it was that she didn’t have another. Her reasoning was that apart from work she had no need for that kind of outfit, so she bought clothes that suited her lifestyle all the other hours of the week. Do we know that men in conventional suits are not opting for unremarkable acceptability of work clothing, clothes they don’t have to think about on workday mornings, so as to leave their minds, wardrobes and disposable $$ for things that are more interesting to them? Other men wear conventional clothing every day, jeans or overalls, checked shirts, t-shirts, sweatshirts. Every working day, slight variations because they get their clothes dirtier quicker than suited types. Does it matter? Does it say to “bright young things” that they shouldn’t take up trades because they would have to wear a uniform, then they shouldn’t be ambitious, innovative and successful and become “businessmen” because they’d have to wear suits that some people think are too dull? I hope that if “our bright young people” are as bright enough to deserve that description they will see beyond what middle aged people of 2016 are wearing and not be deterred from following whatever path fits their abilities. Smart people know they can define themselves, no matter what outfits they have to wear at various stages of their lives. And the more successful, the more scope they have for presenting themselves in self-defined ways, suit-wearers or rocking bush shirts with lurex shorts and Rasta beanies. Goodness, is this the part where it’s up to me to respond, “Nyah nyah, is not, back to you double, eat my shorts” or do we abandon discussion and go all childish? Baldrick’s cunning plan will have to wait as Blackadder and his troops go over the top in a poignant and powerful finale to the series. Baldrick helps Blackadder rewrite the entire English dictionary before Doctor Johnson returns. But they’re not getting very far. Men and women who’ve ‘made it’ (made what? ), can wear what they choose, and the self employed. I would not be interested in hiring an architect in a seersucker, button down suit. Impression management indicates conventional. No sexist comments here please! Strangeways. UK prison. Also colonial Brit who gets shot in ‘Dr No’. ‘Two weeks in another town’. Silly melodrama starring ‘Dimple chin’. ‘Town without Putty’. NZ version of Gene Pitney hit. With you, yes – Baldrick is a sartorial delight. If he were a business genius of today he’d corner the market in turnips, then out-style everyone in suits woven from organic turnip peelings. Hype, Baldrick is now an honorary member of the “Old Digs Club”, see him regularly on the History Channel. Sartorial elegance didn’t get him there I’m sure, as it won’t any of the youngsters being pandered to by the ODT and John Key unless they produce the goods, whatever that might be. Calvin, the dig was East Sussex tonight, land of ancestors, aargh. Romans and Britons.